Understanding sets, set-groups, intervals, and more! Swimming is without a question one of the best forms of physical activity you can do to improve your health and fitness. This is why it’s super important to understand how workouts are structured to get the most bang for your buck in the water. 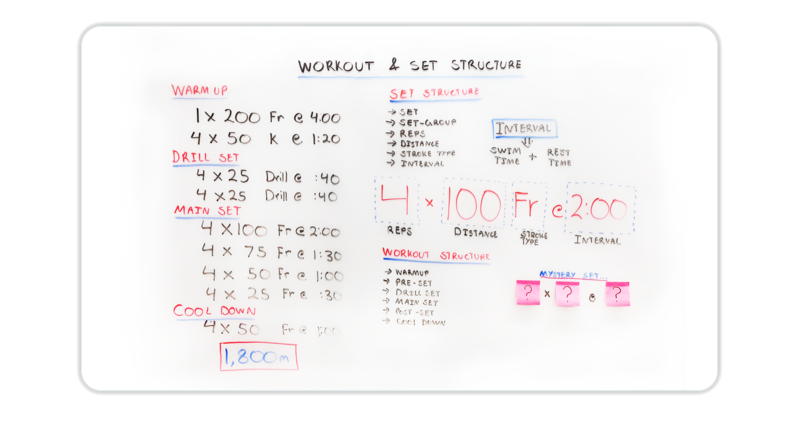 In this episode of Whiteboard Wednesday, Fares overviews workout and set structure. Howdy swim fans, here with another episode of Whiteboard Wednesday. Today, we’re talking about the workout and set structure. Swimming can be a super powerful form of exercise, but to get the most out of it, you need to understand how a workout is actually created. Understanding the structure of the workout will allow you to have the most efficient and powerful workouts. To start, let’s look at a set. An individual set is a specific way that you’ll do a certain number of repetitions, over a certain distance, with a certain stroke type in a specified amount of rest. Interval training is a really important concept to understand because it will allow you to get the most efficient aerobic training. The total interval is a factor of your total swim time plus total rest time. You can have an interval based on number of breaths taken or simply rest time. The most standard form of interval training in competitive swimming is swim time + rest time. If you can swim a 100 freestyle in 90 seconds, you’ll have 30 seconds rest before leaving for the next repetition. 4 x 100s Freestyle @ 2:00 will take 8:00. If it takes you 90 seconds to swim each 100, then your total set time will be 8:00, even though you only swam for 6:00. The next step to understanding how a workout and set is created, is its flow. Each workout has a few major components to it and these ‘parts’ of the workout differ based on the point of the season you’re in and the type of workout that you’re doing. Most workouts start with a ‘Warmup’ and are then followed by a ‘Pre Set’ or ‘Drill Set’. After these first two parts, you’ll do the ‘Main Set’ followed by a ‘Cool Down’ set. There are other set-groups that can build a workout, but some may not be present in every single workout that you do. When you do a drill set before the main set, the goal is to apply whatever skill you were working on in the drill set into the main set. The goal of this example set is aerobic focused in nature. In this workout, the interval pace on the main set stays constant across each set relative to distance. For example, the 100 distance on the 2:00 interval is 30 seconds per 25 distance. This total workout is 1,800 meters. Sometimes the main set or pre-set will have a repeat bracket. For example instead of doing the main set once through, you could do the entire main set for multiple rounds. In this workout doubling the Main Set would add another 1,000 meters to the workout. As you can see there’s a lot of manipulation that can be done to the actual workout structure that leaves the fundamental components in place, but can drastically change the overall impact of the workout. I hope this video showed you how some of the elements of swimming workouts and sets fit together to create the most optimal workout for you. Until next time, have fun and happy swimming! What does « pull » mean in an interval training? How can i get to set longer intervals. Im a beginner and i cant swim fast enough. Hi Robin, great question! Pulling is swimming without kicking. It’s generally done by putting a Pull Buoy between your legs to keep them afloat while you swim, so you can focus on your arms. Oftentimes, pulling involves wearing Paddles, which are flat plastic things you attach to your hands to add resistance so you pull harder and swim faster. If you need to adjust your intervals, you can edit any workout and adjust your Dynamic Interval times in your workout settings in the app – that will slow everything down. Email us at support@myswimpro.com if you have any more questions. Thanks! What to do if I only want to putt rest time in my workout set, not inteval ? Hi Dominik, great question. Right now you can only set up your workouts with intervals, you cannot just structure it by rest times. What I would recommend though is setting an interval time that’s easy to reach, then if you have a smart watch that you’re syncing workouts to, you can manually adjust the rest time in between sets or set groups to whatever you choose. So once you finish one interval, just tap ‘Next Set’ on your watch and then you’ll have the defined rest period. Any other questions? Emails us at support@myswimpro.com. Thanks!